Archie Graham Jernigan, 76, left us to be with the Lord on Sunday, March 24, 2019 at his home, with his family by his side. He was born on April 29, 1942 to the late George Alton and Willie Lee Jernigan. Graham grew up in Sampson County and graduated from Midway High School. 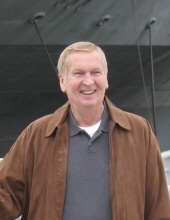 In 1960 he joined the US Navy serving aboard the USS Intrepid. He was a successful businessman owning several businesses in Dunn. He was a loving husband, father and grandfather and enjoyed his beautiful home overlooking Jernigan’s Pond. A funeral service will be held 11 a.m. Wednesday, March 27, 2019 at Skinner & Smith Funeral Home Chapel with Rev. Rick Kelly officiating. Burial will follow at Stoney Run Church Cemetery. He is survived by his wife of 42 years, Sandra Stone Jernigan of Dunn; two sons, Scott Jernigan of Durham, Steve Coats and wife, Leigh of Clayton, daughter, Wendy Reardon of Raleigh, Sisters, Francis Mitchell and Brookie Alexander of Raleigh, grandchildren, Jason Hayes, Tyler Coats and wife Jamie, Conner Coats, Michael Reardon and Megan Reardon and several nieces and nephews. The family will receive friends 6-8 p.m. Tuesday at the funeral home and at other times at the home. To send flowers or a remembrance gift to the family of Archie Graham Jernigan, please visit our Tribute Store. "Email Address" would like to share the life celebration of Archie Graham Jernigan. Click on the "link" to go to share a favorite memory or leave a condolence message for the family.